With Superintendent Ramon Cortines voicing opposition to the idea, the future of LA Unified’s plan to make the district the second in the state to require an ethnic studies course as a high school graduation requirement appears to be in doubt. The LA Unified school board made big headlines in the fall when it became the second district in the state to require an ethnic studies course be taken by all high school students as a graduation requirement — El Rancho High School in Pico Rivera was the first. But a recent estimate by the district that it will cost $72.7 million — which was much larger than an original estimate of $3.4 million — along with the Ethnic Studies Committee’s recommendation to delay its full implementation makes it likely the school board will be reexamining the issue soon. 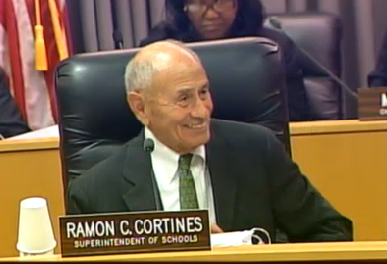 Ethnic Studies Now!, a group that helped organize the campaign for the ethnic studies resolution, is planning to stage a protest at the June 9 board meeting in reaction to Cortines’ letter. The board is not scheduled to be voting on any resolutions regarding ethnic studies, according to its meeting agenda. The Ethnic Studies Committee, which was formed by Cortines as a result of the board’s ethnic studies resolution, is meeting today and will be discussing a reaction to Cortines’ letter, according to committee member Allan Kakassy.